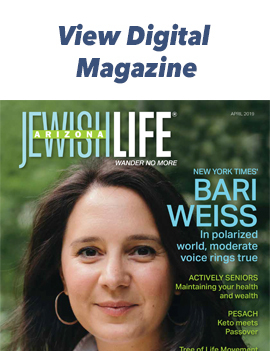 We’ve come a long way, baby … A loving tribute to Ohio wife and mother turned longtime Arizona resident who made herself into a national superstar as a best-selling author and syndicated journalist lauded for opening up the secret world of the mother and housewife. A comic look at one of our country’s most beloved voices – a voice that reassures us that yes, the world is sometimes crazy, but if we look at it and laugh, we have most of it covered. Learn the Mishnah every morning with Rabbi Israel Becker, Monday-Friday 6:15 AM, Shabbos 8:15 AM and Sundays and Major Secular Holidays 7:15 AM. No school, no worries. We have fun-filled days of STEM activities, sports, swimming, arts, games, weekly field trip and more! Grades K-4. For pricing and additional information, visit vosjcc.org/pardesspringbreak. This stunning new world premiere play features the relationship between polar opposites and modern-day legends, Ruth Bader Ginsberg and Sandra Day O’Connor. 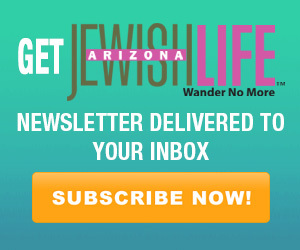 For advertising information, please contact advertise@azjewishlife.com.